You are currently browsing the category archive for the ‘Biking’ category. Fall is my favorite time of year, but it creates a challenge for exercising, at least during the week. The days get shorter, the temperatures cooler and the kids after-school activities more frequent, which leaves less time for biking or running. Yesterday I left work a little early. The temperature was right, the winds negligible and the sunlight still beaming. I hopped on my bike and took off down the road. My muscles complained a bit with the unfamiliar movement since I’d been doing more running and less biking lately. to lower itself on the horizon. My bright pink vests increases visibility, but I still didn’t want to get caught in the dark. home as the shadows grew longer and the air cooler but still a bit of light in the sky. Today, I beat the daylight but soon it will be no match. Even though I plan to run outside during the winter, the shorter days and challenging winter weather means much of my exercise time will be spent inside. This Sunday I will compete in the Iron Girl Duathlon which will be held at Normandale Lake Park in Bloomington MN. The race starts with a 2 mile run, followed by a 22 mile bike ride then finishes with another 2 mile run. than I ever have in the past. I realize I’m not doing as many as some other may be, but it’s still an increase for me. Mentally it has been a great experience to take on challenges, set goals and accomplish them. I have to admit I’m starting to get nervous, or perhaps excited would be a better word. After focusing on this race all summer, it’s only a few short days away. From all I hear, it’s a great event. Since I haven’t done this before, I don’t have any specific times in mind. My only goal is to compete as well as I can and to have fun. My kids call me Iron Mom and I can’t wait to be one after the race on Sunday. An unexpected snow storm blew up Friday and as you can see by the picture, the wind was blowing hard. 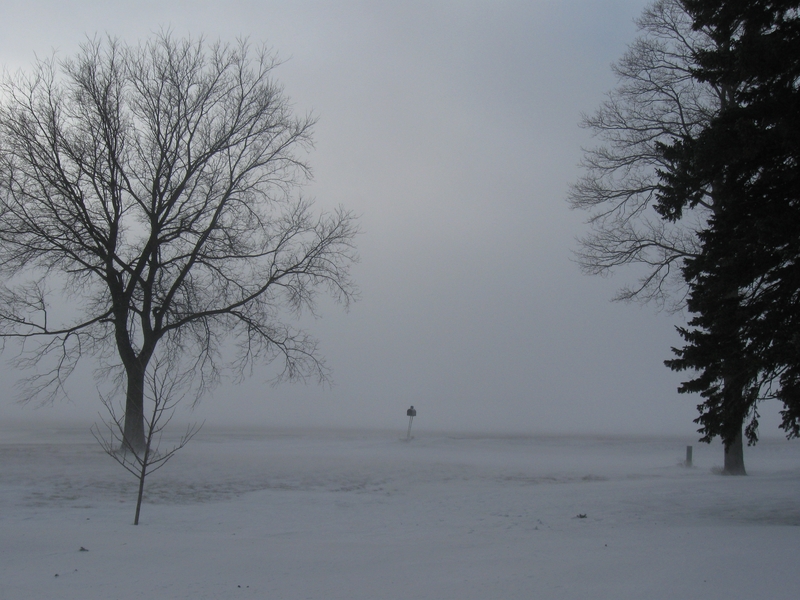 You may be curious why this blog is called winter biking. No, I’m not crazy enough to try biking in the snow and ice. For my birthday/Christmas gift, Dale gave me a Cyclotron, which is a frame that holds the rear wheel axel on my bike so that I can bike outdoors. Biking indoors helps break up the monotony of the treadmill. Even though I vary my workouts, it’s nice to do something different. So far, I’ve enjoyed biking. The only downside is that the speedometer/ odometer is on the front wheel of my bike, which doesn’t move. So I have no way of tracking how fast or how far I go. (Yes, I feel the need for speed). This forces me to go by time and I really don’t like watching the clock. But I can watch TV or a movie and it helps pass the time away. It’s nice to have alternatives on days like these. With the fall season officially here, it’s time to say goodbye to much of the garden produce. Beets, carrots and potatoes have all been dug and are ready for winter storage. The tomato plants have produced well, but are starting to fade and the recent heavy rains have been hard on them. Only the squash, pumpkins and sweet potatoes remain in the garden, as we wait until they reach full maturity. Fall is my favorite time of year. I love the warm sunny days and the cool crisp nights. The colorful leaves paint a wonderful picture across the trees. The fall air has a certain scent that is easy to identify, but hard to explain. Going for bike rides and running seems extra special because I know that in a few weeks, the weather will change and not be as pleasant. A few apples hang on the trees and we continue to harvest them as best we can before they fall to the ground. Apple pies, crisps, pancakes and applesauce dominate the menu as we try to eat them at their peak. Soon I’ll put away the tomato cages, haul off the excess vines and have Dale till the garden. Before too long a blanket of snow will cover the ground as it goes dormant over the winter in preparation for spring and the next garden season. Today marks the first day of summer vacation for all the kids, although Brett says it doesn’t officially start until Monday, because they wouldn’t have had school today anyway. For those of you that have been following the boys during track season, I’d have to say that both boys had a good season. Brett ran the 3200 m race and his best time was 11:29. Adam competed mainly in the 1600 m run and his best time was 5:49. Both gained a great deal of experience that they will be able to build on in the future. But the running isn’t done. Now it’s time to get their base summer miles so that they will be ready for cross country season in the fall. The coach expects them to log their summer miles. They will be working to get enough miles to join either the 200 or 300 mile club. Cross country camp, which involves camping and running in Forestville State Park is a highlight of their summer. All of us are looking forward to Grandma’s in two weeks. It’s not just the running, but the activities that will take place and a chance to visit with friends we’ve made along the way. The boys have their goals for the summer and looking ahead on the calendar; it looks like it’s going to be busy. Here’s to summer! “Let’s do laundry”. These are the code words that Teresa Stevermer, my good friend who’s running the half marathon at Grandma’s, and I use when we want to go biking. We started this last year. It seems like every time we wanted to go biking, it would be rainy and windy. But if we said “let’s do laundry”, the weather would be nice. Apparently even the weather doesn’t like laundry. Even though we live only ½ a mile from each other and our kids are in activities together, biking allows us to catch up with what’s happening in each other’s lives. It’s also a chance to vent our frustrations and channel that energy towards something positive, exercise. Yesterday we biked around Mankato. We started in Rapidan on the Red Jacket trail and ended up north of Mankato on the Sakatah trail. These are really nice trails and we discovered a new park only a few blocks from where I work. The river and buildings have different perspective when you’re biking right next to them and not on the street in your car. On the way back, after we’d done about 24-25 miles, we decided to take a trail that led to Minneopa Park. I don’t think that either of us realized we’d have to bike up a big, long hill. Even though our legs were tired and we were low on energy we kept going. About half way up the hill, in a moment of weakness, I shouted out “I’m going to walk”. Teresa looked back at me and said “really?” With that I knew I couldn’t walk and slowly, but surely we made it up the hill. After a mile or so of recovery, we decided going to Minneopa may be farther than what we wanted to do, so we headed back to Rapidan. For the day, we biked 32 miles. The second best part of “doing laundry” is lunch. We ate at the Cottage Café in Amboy. I don’t think there was a bit of food left on our plates. Teresa and I talked about how much we enjoy being involved in our kids’ activities, but we also need time for ourselves. Biking provides us some great get away time and just as important, good exercise. So the next time you hear Teresa and I talking about “doing laundry” it may mean more than you think. We’re already planning the next laundry day.